Happy Sunshine week (well, technically it’s next week, March 10-16, 2019)! 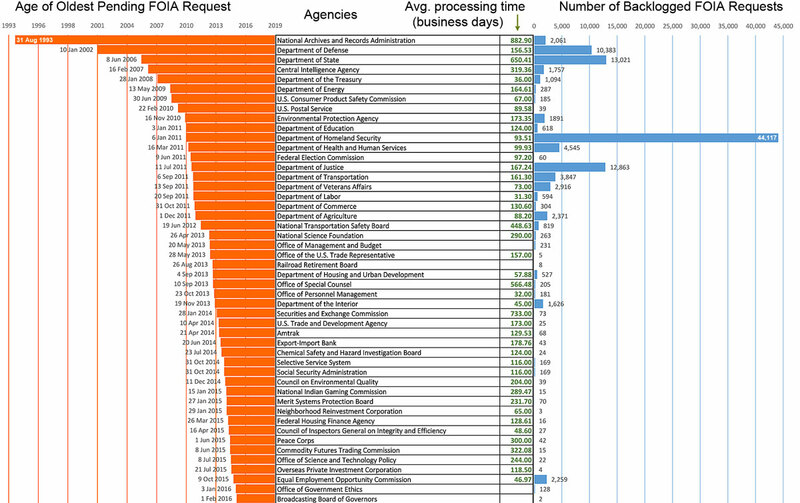 The National Security Archive did a massive FOIA audit which showed that FOIA delays and backlogs continue across federal agencies. the most interesting/disturbing to me were the requests that fell into a FOIA “referral black hole” where agencies refer to or consult with other agencies on “any FOIA request in which it feels another agency or agencies may possibly claim ownership of, or “equity” in, the information within the records.” These referrals often result in massive delays. One of the easiest ways to better deal with these referral delays is to allow FOIA.gov‘s request form to be submitted to multiple agencies (or multiple units within agencies) if the requester feels that the question overlaps agencies. but If anyone has other good ideas for how agencies can more quickly deal with the “referral black hole” please send me an email at freegovinfo AT gmail DOT com. Washington, D.C. March 8, 2019 – Five federal agencies have FOIA requests more than a decade old and one, the National Archives and Records Administration, has a FOIA request more than 25 years old, this according to a National Security Archive Audit released today to mark the beginning of Sunshine Week. The survey also found there is a correlation between agencies with the oldest FOIA requests and those with the largest FOIA backlogs. The Archive Audit team parsed through the annual FOIA reports federal agencies are required to submit to the Department of Justice’s Office of Information Policy and found that while many agencies appear to have used new reporting requirements as a tool to address the oldest agency FOIA requests, others have let decades-old requests linger. The Archive used the Fiscal Year 2017 reports because they were the most comprehensive collection available at the time of publication due to the delay caused by the government shutdown, and will update this posting once the complete set of FY 2018 reports are available. The key driver for FOIA requests that could be renting cars by now and growing backlogs is the “referral black hole.” Agencies currently refer or consult on any FOIA request in which it feels another agency or agencies may possibly claim ownership of, or “equity” in, the information within the records. This daisy chain of referrals can often result in decades-long delay, and the re-review of the same document by multiple agencies is redundant, costly, and inefficient. via 25-Year-Old FOIA Request Confirms FOIA Delays Continue Unabated | National Security Archive. We posted about the Dept of Interior records schedule request to NARA and have been actively working on this issue for a few weeks now. Patrice McDermott, Director of Government Information Watch — many of you will have known Patrice from her ALA Washington Office days or laster as director of Open The Government — just posted the request below to govdoc-l so I thought I’d share beyond the govt documents library community. Please check out the draft letter that Patrice and several others in the FOIA/open govt communities have penned. Send any comments or concerns her way. And if you’d like to copy/paste anything from her letter — or from Stanford UL’s letter to AOTUS Ferriero for that matter — for your own comment to NARA, please do so BY NOVEMBER 26! Here is a DRAFT letter/comments to NARA. Many thanks to the folks who have been working on this – this letter draws heavily on your work. It dawned on me that T’giving week is almost upon us… I plan to send this Friday 23 November. It is open to both organizational and individual signatories. As you may know, the DOI has put in a request to NARA for disposition authority for a large # of record groups. Disposition does not equal immediate destruction; mostly the records would be marked Temporary — with ‘disposal’ dates that vary greatly based on the records, what they document, etc. Very few govt records (1-3%, according to NARA) are designated as Permanent/Archival. The request is confusing to read & follow because DOI — following NARA guidance of recent years — has moved what used to be discrete series of records with discrete records schedules (as permanent or temporary) into what are being called ‘big buckets.’ The DOI request is essentially cross-walking discrete records series to their new bucket. And made the request for all of the buckets at one time. The volume aside, there are a number of concerning aspects to this request. I pulled together an annotated version of the NARA appraisal memo to get a handle on what was requested – and provisionally approved by NARA. I highlighted language in the Appraisal Memo (Blue=Good retention; Green = NARA comments worth noting; Orang(ish) = Concerning), and indicated the #s of Records Groups (not #s of records) covered in each NARA appraisal entry. Regardless of who the Secretary of Interior is or may be, it gives me pause to put authority for requesting disposal for these sensitive records in the office of a political appointee. So, there is a potential question for NARA (or its Hill overseers). I am really troubled by the repeated language — by NARA — about “interest to NARA Researchers” (as opposed to?? ), and that records “do not document significant actions of federal officials”. I would welcome your thoughts on particular sets of records/buckets and how they have been appraised — where the appraisal may fail to address the research/legal/etc needs of other communities (other than “NARA researchers”), where data, on which ongoing datasets are built, might be irretrievably destroyed, etc. Last week, we posted a story “Holes in History: The Dept of Interior request to destroy records” in which we raised issues concerning NARA’s records scheduling process in general and the DoI request in particular.